With this year marking the 400th anniversary of Shakespeare’s death, theater stages in Seoul have seen their fair share of tribute performances of some of the playwright’s most-beloved masterpieces this year. In April, the Seoul Metropolitan Theatre opened its 2016 season with a production of “Henry IV: Part I and II,” the first time the play was performed in Seoul in 14 years. 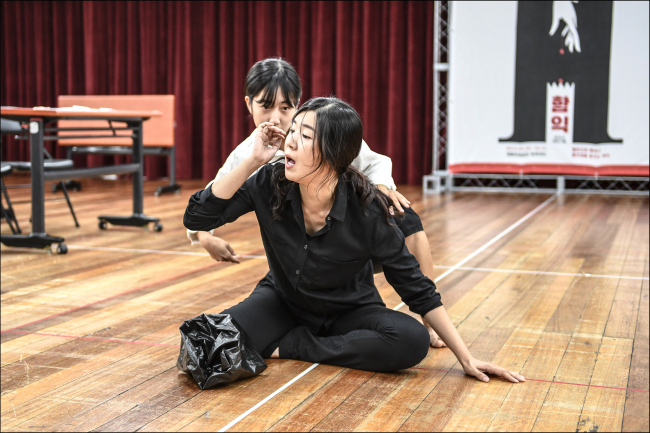 Once again bringing back the works of Shakespeare this month, the Seoul theater troupe is gearing up to present “Ham-ick,” written by Kim Eun-seong and directed by Kim Gwang-bo. The play stands as a complete modern day reinterpretation of this classic tale of human tragedy. “Although ‘Ham-ick’ starts out like Shakespeare’s ‘Hamlet’ it actually takes a dramatic new twist,” said playwright Kim, during a press rehearsal at the Sejong Center in Seoul on Thursday. In Shakespeare’s Hamlet, the lead character learns his father was murdered by his uncle, who goes on to marry his mother. The new Korean play takes the original psychological struggles of Hamlet and reinterprets this mental anguish via a woman named Ham-ick, with an alter ego mirroring the fair Juliet who wants to know true love. Crazed for two decades by rumors that her mother, who supposedly committed suicide, was actually killed by her father and stepmother, her mental agony takes on a new twist when a new man is introduced into her life. The upcoming staging of “Ham-ick” will star Choi Nah-ra, Lee Ji-yeon, Kang Shin-gu, Yoon Nah-mu, Hwang Sung-dae and Park Ki-deok. The performance will be held from Sept. 30 to Oct. 16 at the Sejong M Theater in Central Seoul. Ticket prices range from 20,000 won ($18) to 50,000 won. For more information, call (02) 399-1000 or visit www.sejongpac.or.kr.